10	 George W. Bush, War Criminal? Is George W. Bush a war criminal for deliberately violating the Geneva Conventions? Can he be prosecuted when he leaves office on January 20, 2009? 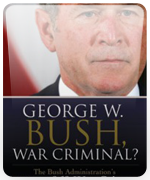 The answers are found in Michael Haas’s George W. Bush, War Criminal? The Bush Administration’s Liability for 269 War Crimes, which documents 269 war crimes and assesses the culpability of Bush and his administration. The goals of this project are to gather testimonies of prisoner abuse in Guantánamo, to organize them in meaningful ways, to make them widely available online, and to preserve them there in perpetuity.